Increasing the diversity of the technical workforce is an essential step in addressing society's technological challenges, according to Brittany Arthur, a junior transfer student majoring in computer science at UCSC's Baskin School of Engineering. Arthur is a student engagement coordinator for Project Awesome: Women in Computing, an ongoing effort to recruit and retain more women students in computer science and computer engineering at UC Santa Cruz. "I believe that the demographics of those involved in the process of creating technology should reflect the consumer market. This could lead us in directions that address unmet needs of those in our community. By increasing the diversity of students who pursue computer science, I believe we can support that reality," she said. Designed to foster a community of scholars based on mutual ambition, support, and empowerment, Project Awesome is part of a strategic plan developed by the Baskin School of Engineering in partnership with the National Center for Women & Information Technology (NCWIT). Arthur is one of two undergraduates hired in fall 2013 to coordinate Project Awesome activities. Remington Maxwell, a sophomore majoring in computer science, is the other student engagement coordinator. "Student engagement in promoting technology is vital to the success of this field. By being a student engagement coordinator, I hope to provide Project Awesome participants with support and other tools they need to be successful and passionate in this new age of technology, and ensure that their opportunities in this field are abundant," Maxwell said. Arthur and Maxwell have been organizing events and activities for women in the engineering school to provide academic and social support as well as opportunities for professional development. 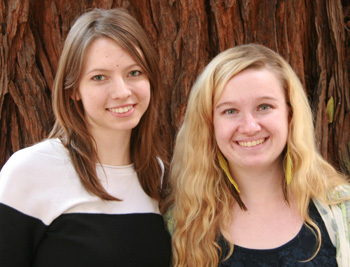 In late January, Project Awesome sponsored UCSC students to attend a Bay Area "She's Geeky" conference. Held at the Computer History Museum in Mountain View, the three-day conference covered a broad range of issues relevant to women in technical fields. Arthur and Maxwell are currently organizing study groups for key computer science classes. They are also reaching out to high school students who participated in the Girls in Engineering program at UCSC when they were in middle school. Improving the recruitment and retention of women in the engineering school requires a broad-based effort, said Charlie McDowell, professor of computer science and associate dean for undergraduate affairs. "Adding new women to the U.S. tech talent pool is a high priority," he said. McDowell is co-chair of the NCWIT Academic Alliance, which seeks to implement institutional changes in higher education that correspond to best practices for promoting success among diverse student populations. "Encouraging young women's interest in technology careers is critical: our workforce needs their creativity and innovation," said Lucy Sanders, CEO and co-founder of NCWIT. In addition to McDowell, the Project Awesome team includes Marilyn Walker, professor of computer science; Adrienne Harrell, director of undergraduate student affairs; and the NCWIT Extension Services consultant, Leslie Grier. Interested students can visit the Project Awesome web site at awesome.soe.ucsc.edu for more information and to sign up for email updates. Students can also connect with the program through the Project Awesome Facebook page.